If insider reports are to be believed, it would appear that James May & Richard Hammond are turning down a deal from the BBC in order to pursue much more lucrative offers elsewhere with their “sacked” friend and former co-presenter, Jeremy Clarkson. “The Mirror” has it here. The source also states that the foursome (including Exec. Producer Andy Wilman) are extremely close to signing a bonkers deal with Netflix. Though we are fairly certain money doesn’t have to do much with the duo’s refusal of the BBC offer we can only imagine how large the sum is from a Netflix proposal. No one is surprised that the (formerly) Top Gear team has been fielding offers from multiple venues like ITV, Netflix and Hulu. Wherever they go they are almost an assured success as their international audience has been clamoring for a Clarkson re-instatement ever since his dismissal in March. Netflix seems like the most savvy fit for the group. Known for pioneering bold and fresh television with monster budgets, it would be easy for the team to feel creatively at home and pick up where they left off. 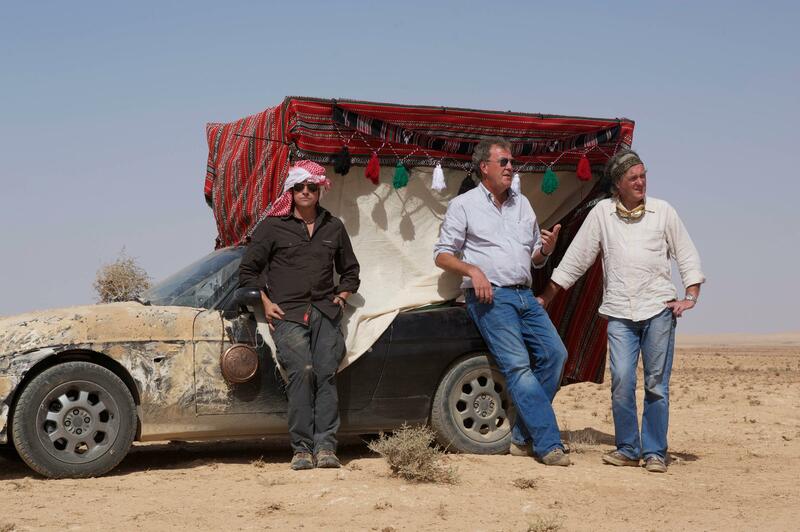 Netflix has to be salivating at the prospect of absorbing Top Gear audience. Reportedly the show reaches around 350 million worldwide, has won the Guiness World record for Most Watched Factual Programme and collected $225.8 million in revenue for the BBC. And it’s not just guys, apparently the show audience is 40% women which is extremely balanced for any tv show, let a lone a car show comprised of 3 aging British men. With those kinds of figures though, it’s difficult to imagine a scenario in which the show WOULDN’T succeed. In any case we are looking forward to the trio getting back together again in whatever form possible, and it couldn’t come soon enough. Previous ArticleUmmm…What Just Happened In The Season (Series?) Finale Of Community? When he is not working on this site, Shea is a full-time video producer for a non-profit humanitarian aid organization. He travels to places like El Salvador, Ukraine, and Kenya to document relief efforts in those countries. He possess a bachelors degree in film studies and enjoys the crap out of reading. Some of his favorite current shows are Game of Thrones, Sherlock, Gilmore Girls (deal with it), Friday Night Lights, The Newsroom, Community, Top Gear, Luther, Downton Abbey, Mad Men, and A Bit Of Fry & Laurie just to name of few. He also likes Formula 1 Racing (random though it may be) and loves his brand new wife Ashley. She is a perfect candidate for the demanding position despite her lack of previous marriage experience.